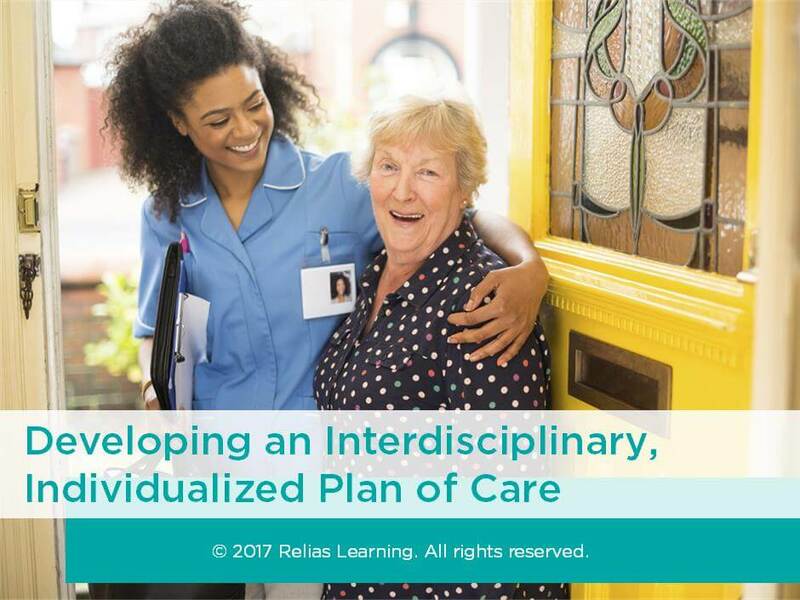 Every home health professional should understand certain key elements when developing appropriate interdisciplinary, individualized plans of care, as well as the ongoing management of that care. This course provides specific instruction to guide home health professionals in their development of interdisciplinary, individualized plans of care. Describe the 5 steps of the care planning process. List the 5 parts of the assessment process in care planning. Outline 3 effective and cost-efficient processes for care planning. Describe 1 essential element of appropriate goal setting. List at least 1 reason why scheduling home health services requires close coordination between professionals. Section 1: Introduction A. About This Course B. Learning Objectives Section 2: Care Planning and the Comprehensive Assessment A. The Importance B. Conditions of Participation C. The Right Approach D. Required Skills and Abilities E. Data Collection for Assessment F. Medication Reconciliation G. Regina H. Review: Look Again! I. Summary Section 3: Problem Identification A. Identification B. Categorizing C. Sequencing D. Revisiting Regina E. Review F. Summary Section 4: Planning A. Planning Process B. Goal Statements C. Timeframes D. Types of Goals E. Interdisciplinary Goals and Priorities F. Interventions G. Interventions for Regina H. Review I. Summary Section 5: Implementation and Evaluation A. Putting it Together B. Interdisciplinary Collaboration C. Communication D. Implementing Change E. Review F. Summary Section 6: Developing Effective and Efficient Care Plans A. Questions B. Use an Interdisciplinary Approach C. Collaborate and Communicate D. Provide Services Efficiently E. Mrs. Smith F. Results G. A Better Plan H. Review I. Summary Section 7: Conclusion A. Summary B. Course Contributors C. References D. Congratulations! The target audience for this course is: entry level Administrators; entry level Nurses; entry level Occupational Therapists; entry level Physical Therapists; intermediate level Speech and Language Pathologists; in the following settings: Acute Care Facility.